What do a six-year-old and a seventy-two year old have in common? Well, a mission trip, of course! 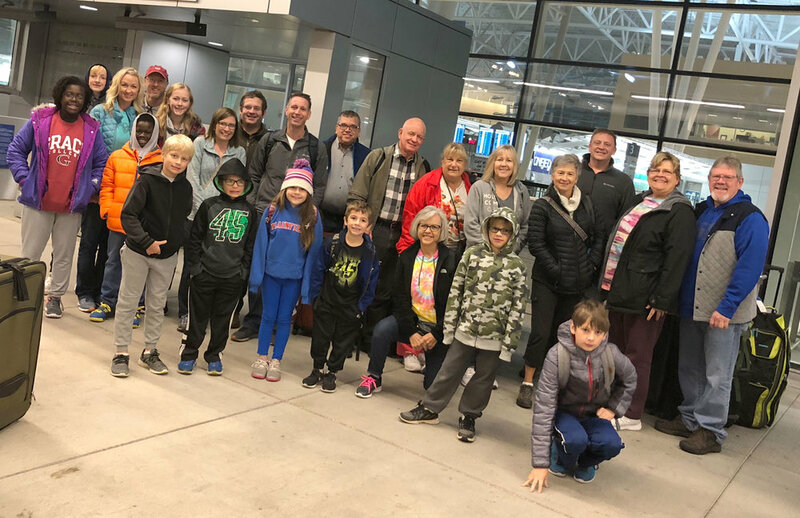 Twenty-four people from PCC traveled to serve Red Sands Christian School in Winslow, Arizona during the first week of Fall Break. We were testing the theory that all ages could serve together on a family mission trip and it truly was a beautiful experience melding four generations into one impactful week. After the Red Sands children were escorted to their classrooms, we were given job assignments for our week. Several on our team were not sure how God would use them, but God had brought together the perfect team. Our first job was to lay the forms and do the excavating for a new side walk—it was wonderful that one of our dads grew up running large machinery on a farm. 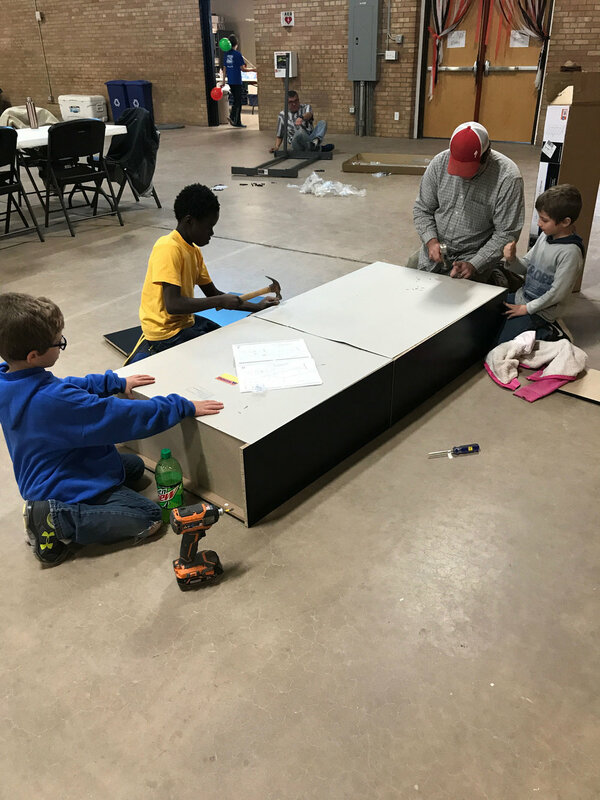 The school’s handicapped showers were still in need of drywall—what a blessing it was to have a brother and sister on the team who were experienced in drywall and painting. The Red Sand’s staff mentioned that the library hadn’t been unpacked if anyone knew how to organize a library—we had a librarian and two elementary school teachers who led us as we produced a beautiful, fully functioning library. As we opened the door to the library, we discovered boxes stacked four feet high and five feet wide crammed full of library books. The next two days we spent sorting the books over one-half of a gym floor. Adults and children alike were invaluable resources sorting books into fiction, non-fiction, picture books, science books, chapter books, and animal books. Our team had the opportunity to prepare a home-cooked meal (including cookies baked by two of our young ladies) for the homeless during our visit. Brian Schultz, a Native American who serves the homeless community, assisted us in picking up and bringing our new friends to a community center. It was a humbling experience to see members or our group washing feet and offering clean, warm socks for the gentlemen and nail care for the ladies. Another day, I was brought to tears watching one of our youngest team members fold his little hands and pray over a homeless gentleman who was cold and hungry. Team members also painted walls and placed a plastic wall board around the kitchen. The kitchen is now prepped for appliances to be installed as funding is available. Any spare time was spent sweeping, dusting, and mopping “red sand” so that the school was clean and safe for the children. Our team became friends quickly as we shared sleeping quarters, shower facilities, prepared meals for each other, prayed for each other, and rode together in the vans! Our youngest travelers kept us entertained with riddles and funny songs. We also had a lot of fun visiting the Rock Art Canyon Ranch, the Little Painted Desert, and we stood “on the corner in Winslow, Arizona”. Our friend, Brian Schultz, said it best, “My life’s like a puzzle. I can’t see the full picture of my puzzle, but God puts people in my path that have a piece of my puzzle. I won’t see the picture of the puzzle until my life’s complete.” During our week in Arizona, many vivid pieces of the puzzle were added to each picture of our lives. Older PostWhy Can't I Seem to Be Free of My Need for Stuff?